Buying a home is typically one of the biggest and most important investments you’ll ever make and you want to make sure that you get all the benefits possible when applying and maintaining a mortgage. There are different tax benefits for first-time homebuyers. Mortgage Credit Certificate. This is a program that can provide an opportunity for first-time homebuyers to get a tax break on mortgage interest. This program, according to the IRS “is intended to help lower income individuals afford homeownership.” It’s unlike a deduction and credits directly against your tax bill and lowers what you owe. Ask your mortgage professional if this is an option for your home loan. Mortgage Points Deduction. Many homeowners overlook the deduction of points paid to secure a mortgage loan. These points are prepaid interest that can also qualify the borrower for a lower interest rate. Because it’s still a payment against the interest, it qualifies for deductions. Mortgage Interest Deduction. This is the biggest tax break that nearly all homeowners can benefit from. This deduction covers interest paid on up to $1 million worth of loans. The interest deduction works on amortization. This means that your first payments will have a higher ratio of interest to principle so you can receive a higher tax benefit upfront. Make sure you file an itemized tax return in order to claim the most mortgage interest payment deduction. Real Estate Tax Deduction. If you are a taxpayer that itemizes your deduction on a Schedule A you may be eligible to elect real estate taxes paid on primary and secondary residences. You can deduct real estate taxes long as they were paid within the year for which you’re filing. The tax paid must also be for your own home, and does not include any homes that you did not own or occupied but may have made payments on. Home Improvements. Home improvements may qualify for deductions in a couple different ways. Home equity loan can qualify for the same mortgage interest deductions as your main mortgage. Tracking home improvements can also help if you plan on selling the home. When you sell, you can include the cost of improvements made to the property when determining your capital gains or losses on the sale. This can actually save thousands in taxes at the time of the sale so be sure to keep your receipts for any major home improvements. Home Energy Tax Credits. This is a credit, unlike a deduction, you can take it right off the top. For homeowners that will make their home a little more energy-efficient can offset the cost of these improvements with a residential energy efficiency property credit. Homeowners could save up to 30% of the total cost of installing certain renewable energy sources in a home. Currently this tax credit is extended through 2016. It applies to technology that harnesses off the grid energy such as solar panels, geothermal heat pumps, fuel cells and any wind turbines. The most common is of course, solar panels. The 30% credit applies to the cost of the materials itself, labor and installation but the credit can only be taken once in the year the item is placed in service. Private Mortgage Insurance Deductions. PMI, or private mortgage insurance, is typically added to a mortgage payment when the loans value exceeds 80% of the homes value. These payments have been detectable in recent years so be sure to check with your tax consultant if it is viable the year in which your filing. 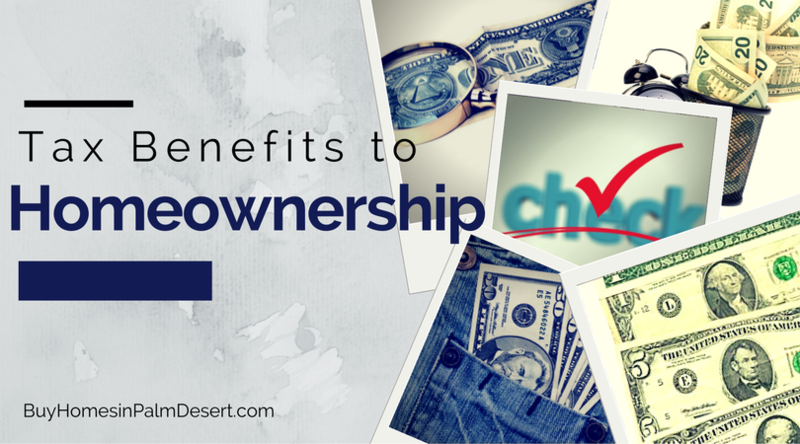 Tax benefits are immense for homeowners so make sure you get every dollar coming to you. If you’re unsure, talk to your tax consultant or advisor about what is deductible and how you can save money each year on your taxes. Ready to buy a home in Palm Desert and surrounding areas? Call me today or browse the website for free!